Despite a consistent push to the high-end side for many NBA sets, 2016-17 Panini Complete Basketball is firmly rooted in the budget-friendly part of the hobby. Each pack averages one insert or parallel. Just like in 2015-16, the set is mainly comprised of a deep base checklist that is one of the largest of the year. With a total of 400 cards, there is strong representation from every NBA team. Parallels include Silver and Gold editions along with new No Back cards. While they are rare, the 2016-17 Panini Complete Basketball Autograph insert features 30 players. However, it is worth noting that nine subjects are only found through the Panini Rewards program. Other 2016-17 Panini Complete Basketball inserts include Complete Players for the league's stars and First Steps, which covers the key 16-17 rookies. Taking a dual approach for top players, Home and Away features two different jerseys for each subject. 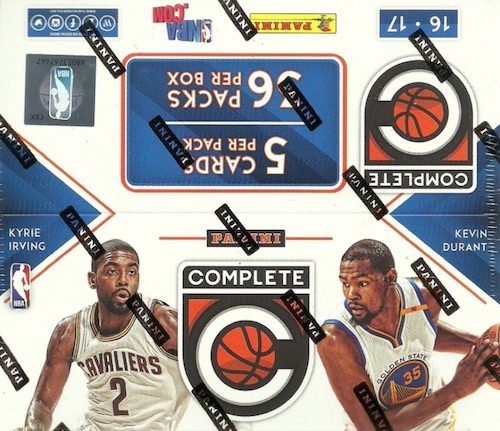 Unlike the debut last year, it appears that 2016-17 Panini Complete Basketball is exclusive to retail but that has not been confirmed. There are several different box formats. *Cards available only through Panini Rewards noted below. Shop for 2016-17 Panini Complete Basketball boxes on eBay. There is already cards on ebay for this retail set. This is the first I heard Panini was going to do a Complete set this year and they are already being sold on ebay. Wow. How can this set be kept a secret in this day of age. Panini cheapened out by blacking out the backgrounds and not having to pay anyone that would normally be in the shot other than the featured player. Inexcusable. Every product they make seems to be a posed shot from a photo shoot or erasing the backgrounds to save on royalties. Go away already. Nick you are clueless the only black back ground photos are of the rookies, and some players that just changed teams, know what your talking about before you bash something. Next I cracked this last year and again this year, I liked the feel of the cards better last year, and the content was slightly better, but the auto checklist this year is much better. 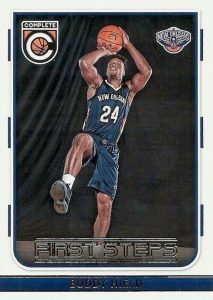 While the set is still too small (the NBA is 450 men, not 400) it’s a lot better than last year’s 330 card set. That’s why I gave it a 4-star rating instead of 5. I had no idea this was going to be issued again but I’m glad it is, because this is what true collecting is all about. Panini has always ignored some players but they finally included one I’ve been wanting to be able to add to my collection: Dewayne Dedmon. He’s been in the League since 2013-14 and these are the first cards he’s ever gotten! Sean Kilpatrick gets his first cards here as well. I believe Livio Jean-Charles is also getting his first cards although I have not kept up on all the high end stuff they do. Disappointed that Mindaugus Kuzminskis of the Knicks (might have spelled his name wrong) is not included. He’s actually contributed a lot to the team this year. I’m also really thrilled that the players are sorted by team. That’s something we’ve not truly gotten in years, especially with the rookies mixed in to their proper teams. I can’t wait to get my hands on a box or two of this set. 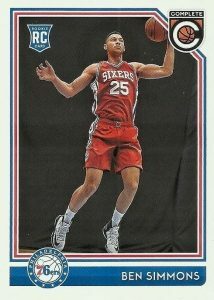 My only complaint is that Dario Saric card has the same pose as in Hoops and Prizm (and almost the same in Donruss). Come on Panini I am tired of seeing him hold that Jersey. … outside of this set. In fact Willy won’t have any card in any set. That’s ridiculous. And until when we should collect cards of players in their old jerseys with the name of the new teams at the botton? The price point of this product is awesome. I Like the look of the card. The cheap old school feel of the cardboard is nostalgic. It’s a great change of pace from Panini’s over produced products. I don’t mind Panani recycling photos between card sets. My big issue with Panini Complete is that is not complete enough. Do like the name of the set implies and cover the entire NBA -Players, coaches, announcers, mascots, owners, GM’s, NBA Officials. Panini be “Complete”! Give collectors a niche product that’s all inclusive of the NBA. Another player not in the set, Jonas Jerebko (Celtics), not in this set and no exist a card of Jerebko with the Celtics jersey. The autographs listed as part of the “Rewards” redemption/program ARE NOT available via the Rewards program unless you manage to have several rewards cards/more than 600 points. So, an actual “hit” of a “Rewards” card DOES NOT bring ANY of the player autos listed with an asterisk in the checklist. Instead, I was offered all non-Complete brand cards, and none of the players specified on the checklist. My choice was LaMarcus Aldridge, National Treasures auto/patch, numbered to 49. While that’s a nice card in itself, I was kind of hoping to get Chris Paul, Blake Griffin, or any of the other players listed with an asterisk as part of the program. Panini – this is false advertising. I wonder what the Texas State Attorney General would say. It’s not at all ethical business practice. Can anyone say bait and switch? One more…I also had to pay $4.35 postage to have the LaMarcus Aldridge card sent via USPS…not much of a reward. Update: I filed a complaint with the State Attorney General where I live and in Texas (Panini HQ) for deceptive advertising – bait and switch – against Panini America. I also forgot to mention that the Aldridge card was from years ago when he played for the Blazers…probably from unsold/reclaimed retail packs/boxes from years gone by. One more – the Aldridge card arrived. Sweet card, but not a “Reward”. The package displayed $3.52 – so Panini even made money off the shipping of the “Reward”. Bottom line is that I’m NEVER buying another product that offers “Rewards”. It’s flat-out bait and switch. Caveat emptor! What sports cards are meant to complete. If they did full annual career stats on the card back this would be perfect. Why no NFL version?